On to the next season! Less than three weeks after the University of Virginia football program handily defeated South Carolina in the 2018 Belk Bowl to cap off an 8-5 campaign, the Cavaliers’ 2019 season schedule was announced by the Atlantic Coast Conference. – Two of UVA’s first three games are against Atlantic Coast Conference competition. Virginia opens the season with an away matchup versus ACC Coastal Division foe Pittsburgh on Saturday, August 31. Florida State then comes to Scott Stadium on Saturday, September 14. The rest of the ACC schedule includes Miami, Duke, Louisville, North Carolina, Georgia Tech and Virginia Tech. – UVA’s out-of-conference schedule includes matchups with three in-state foes – home contests versus William & Mary, Old Dominion and Liberty – as well as an away matchup with Notre Dame in South Bend. – There are seven home games and five away games. After the season opener at Pitt, UVA hosts 3-straight games in Scott Stadium before taking to the road against Notre Dame on September 28. Beginning with the Irish, Virginia endures a stretch where four of fives games are on the road. UVA then finishes out the 2019 regular season with three straight home games. – There are three Friday games – the home opener versus William & Mary on September 6, the October 11 matchup at Miami, and the regular season finale against Virginia Tech. – There are two bye weekends – October 5 and November 14. – Six of Virginia’s 12 opponents will feature new head coaches – William & Mary, Miami, Louisville, North Carolina, Georgia Tech and Liberty. William & Mary’s new head man is former Cavalier head coach Mike London. – The Panthers captured the ACC Coastal Division championship in 2018 and finished with a 7-7 record. Virginia has yet to defeat Pitt in the Mendenhall era. – Former Virginia head coach Mike London returns to Scott Stadium as new head coach at William & Mary. This game will be played on a Friday night. – The Seminoles are looking to rebound from the 5-7 record posted in its first season under head coach Willie Taggart. – The first-ever meeting between the Cavaliers and Monarchs. The latter posted a 4-8 mark in 2018. – This will be the first matchup between Virginia and Notre Dame in South Bend. The Irish finished 12-1 in 2018, earning a spot in the College Football Playoff this past season before bowing out to eventual national champ Clemson in the semifinals. – Miami, which finished with a 7-6 record in 2018, will be under new leadership in 2019 with Manny Diaz as head coach. Diaz served as the Hurricanes’ defensive coordinator for the past three seasons before being tabbed as the new head coach following the resignation of Mark Richt last month. 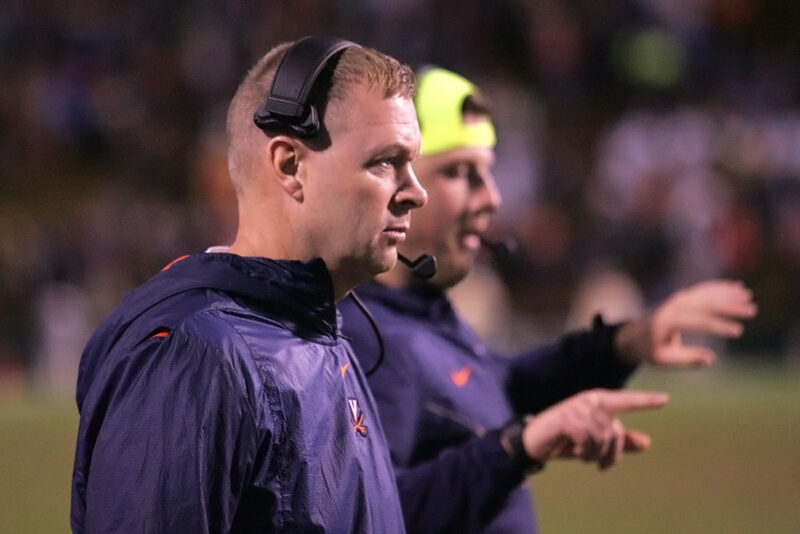 – Virginia looks to go 4-0 against the Blue Devils under Coach Mendenhall. Duke, which finished with a 7-6 mark in 2018, will be without quarterback Daniel Jones, who announced last month that he was foregoing his final year of eligibility to enter the 2019 NFL Draft. Virginia absolutely dominated Jones the past three seasons. – Louisville will be under the direction of former Appalachian State head coach Scott Satterfield in 2019. The Cardinals suffered through a miserable 2018 campaign in which they finished with a 2-10 record. – Mack Brown returns as head coach of North Carolina, where he previously served from 1988-1997, compiling a 69-46-1 record. The Tar Heels finished 2018 with a 2-9 record under Larry Fedora. – Former Temple head coach Geoff Collins assumes the same role with Georgia Tech, which went 7-6 in its final season under Paul Johnson. No more triple option attack from the Yellow Jackets. – Former Ole Miss head coach Hugh Freeze takes over for Turner Gil, who resigned after guiding the Flames to a 6-6 record in the program’s first year on the FBS level. – UVA squandered a golden opportunity to take back the Commonwealth Cup in 2018. Will 2019 be the year the Cavaliers put an end to Tech’s series winning streak, which now stands at 15? The Hokies look to rebound from an otherwise down year in which they finished with a losing record (6-7). In addition to the schedule dates, here are some other Virginia football dates to mark on your calendar. April 27 – George Welsh Tribute. The Virginia athletics department announced it will host an event to celebrate the life and contributions of former Cavalier head football coach George Welsh on Saturday, April 27. The time, location and details of the event will be announced at a later date. This will be held on the same day as the Spring Game.